All our Safety Pin watches are hand made specifically for you. Therefore, the number of beads in a specific color may vary slightly. In addition, Safety Pin watches may take up to 5 days to manufacture and ship to you. 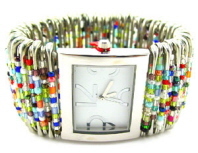 Safety Pin watches are made to fit wrist size 5 inches to 8 inches.